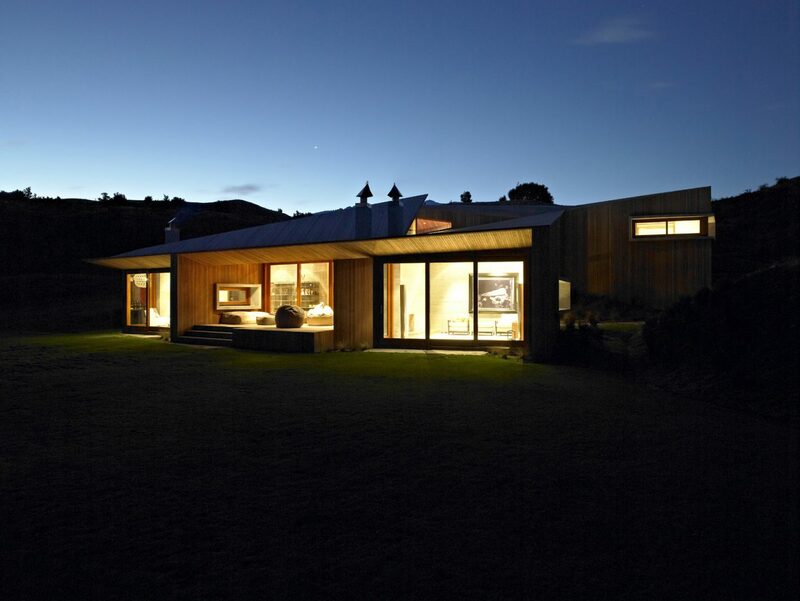 The House is situated amongst the tussock covered hills of Roy’s Peninsula on the shores of Lake Wanaka. Our clients, originally from the South Island, split their time between their homes in Auckland and Wanaka. They asked for a generous and sociable home to accommodate their family and friends. The outstanding natural environment required a sensitive approach to the design, with the local council imposing restrictions on the size and location of the building platform and the materials used. Our design employs an architectural language of triangulated geometries and origami-like cuts and folds to create a sculptural form that relates strongly to the mountainous landscape. The structure of the house is pre-cast concrete, raw to the interior, with an external cedar rain-screen to the walls and roof selected to weather into the natural environment. The mass of the concrete and stone interior gives a sense of protection in the face of the power of the landscape and the extreme regional climate. The materiality of the building is earthy and textured with natural finishes but it is assembled with craft and precision. 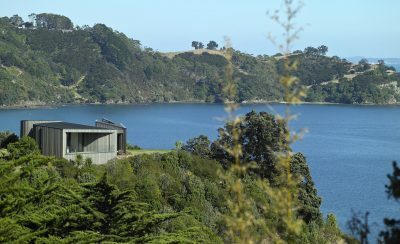 The primary pitched roof plane echoes the slope of the land, forming an sheltered verandah to the lake-front and a double storey back section with garaging below and bedrooms above. The lifted triangular skylight allows natural light to penetrate into the living spaces throughout the day. These interconnected spaces are unified by the timber roof above but individually defined by the stepping floor levels and the geometry of the perimeter walls. The house is an exploration of the relationship between architecture and landscape and an investigation into regional difference.